RMDS will be closed next week for the midterm break. Normal closing time on Friday. The result of the ballot on Tuesday was 73% in favour of changing the name of the school council to the RMDS Student Council. Thanks to everyone who voted. The annual World Cup Football competition will get underway straight after the midterm break. Big thank you to all of the Parents and Children who turned out last Friday to the RMDS Cinema Night! A great night was had by all! Special thanks to Kieran Walsh who provided the fantastic movie selection, and also to Tim Gill who was our techy expert on the night. We will be back after the midterm with details of our next event - the RMDS Book Swop which will take place on World Book Day, 5th March! In the meantime, wishing all an enjoyable week. 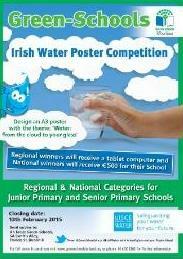 We have collected all the entries for the Irish Water Poster competition from all classes and have sent them to GreenschoolsIreland.org for judging! Good Luck RMDS! This month Rang 1 have been selected as RMDS Green Schools Class of the Month! 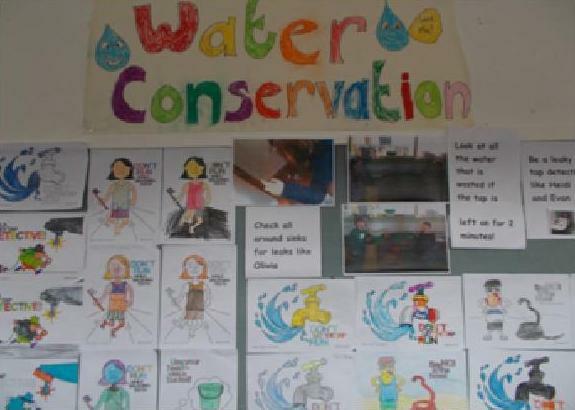 The committee noticed that everyone in Rang 1 is very interested in learning about water and how it can be used and not wasted! We like their display – see the picture below!